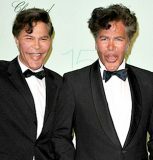 The Bogdanov brothers were born in the Commune of Saint-Lary, in the Gascony region of southwest France. The brothers came from aristocratic Russian and Austrian families, and their maternal grandfather was noted African-American lyric tenor Roland Hayes. was given a PhD in theoretical physics from the University of Burgundy. The pioneering subject of the two thesis is about the state of the « pre-Universe » before the big bang. In 2001 and 2002 the brothers published five papers in peer-reviewed physics journals, including Annals of Physics and Classical and Quantum Gravity. Since 2005, Igor Bogdanov and Grichka Bogdanov have been professors at the Megatrend University where they also hold the Chair of Cosmology and they direct the Megatrend Laboratory of Cosmology where they continue their research.